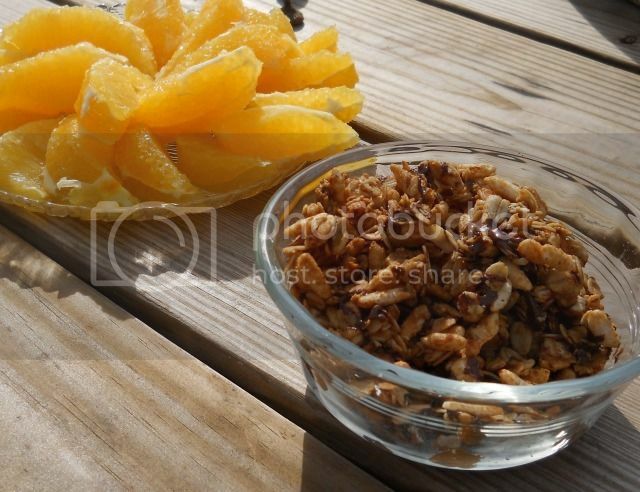 A friend shared this link recently and that opened my eyes to just how easy making homemade granola can be. When I searched online I found many versions, even one that used 14 cups of oats! We tried four varieties, and all are a hit. This will definitely be a repeated recipe as we work toward healthier eating in our house. Combine sucanat, oils and honey in a small saucepan. Mix remaining dry ingredients in large bowl. Bring to a low boil, stirring constantly. Remove from heat and stir in vanilla. Pour over oats; stir until all pieces are coated. Pour onto jellyroll pan lined with foil. Bake at 375 for 10 min. Stir and return pan to oven. Leave in closed oven (which has been turned off) for at least 3 hours. Combine sucanat, oils, peanut butter, and honey in a small saucepan. 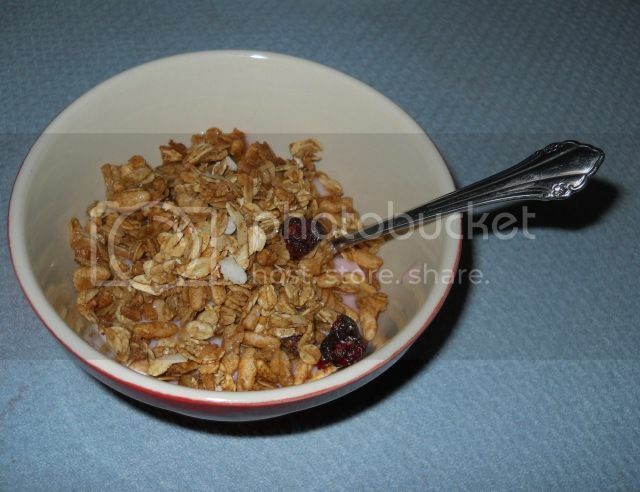 Mix cereals and cinnamon in large bowl. Bring to a low boil, stirring constantly. Remove from heat and stir in vanilla. Pour over oats; stir until all pieces are coated. Pour onto jellyroll pan lined with foil. Bake at 375 for 10 min. Stir and return pan to oven. Leave in closed oven (which has been turned off) for at least 3 hours. After it has completely cooled, stir in chocolate chips. This one was attempted because Heather and I have enjoyed an apple granola found in the self serve bins at Whole Foods. This homemade version didn't have as much crunch; maybe the oil is necessary for that. Just as applesauce can be substituted for oil in baked goods, I read of substituting it in granola. To this I added coconut before it was baked then stirred in dehydrated apple pieces and dried cranberries after it had completely cooled. Combine sucanat, oils and honey in a small saucepan. Mix spices, cereal, and coconut in large bowl. Bring to a low boil, stirring constantly. Remove from heat and stir in vanilla. Pour over oats; stir until all pieces are coated. Pour onto jellyroll pan lined with foil. Bake at 375 for 10 min. Stir and return pan to oven. Leave in closed oven (which has been turned off) for at least 3 hours. When cooled, stir in dried fruit. When I shared with my Granny about how yummy the granola turned out, she requested a sugar free version. I mixed applesauce, Splenda, and just a spoonful of coconut oil, added vanilla after heating that, then stirred enough oats into the pot to all be covered without still being juicy. I baked it on a cookie sheet as before, and she showed her enjoyment by eating it soon after it was delivered. We have enjoyed this for breakfast and at snack time. It is delicious paired with fresh orange juice or fruit, yogurt, or homemade applesauce. Sounds great! I might try the one with peanut butter. Thanks for the recipes. Thank you for the recipes. I am looking for new foods for breakfast and I'm sure one of these will work. I love granola. Thanks for sharing the recipes!